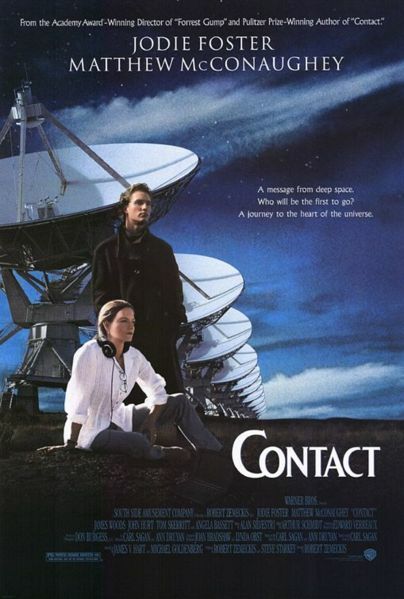 When I first started researching the film version of Contact, I quickly noted many of the differences between the novel (which I had already finished reading) and the movie (which I had yet to view.) I quickly began forming prejudices in my mind against the film, expecting far too much to be changed from the book version. But when I actually sat down and watched the film, I was impressed at how the film still managed to keep the philosophical questions posed by the book in the forefront of the story, even if the plot was a bit altered. The main differences between the two versions stem mostly from the characters: changes in personality, and omissions in general. The largest and most important change to any character's persona is that of Palmer Joss. In the book, Joss was a preacher, representing the religious views on the Message and the universe. He served as a foil character to both Ellie Arroway, the strong agnostic woman of science, and Revered Billy Ranki n, a hardline fundamentalist Christian. (Rankin did not appear in the movie, unless you count the good Rev. Crazy Suicide Bomber.) In the movie, Joss was no longer a preacher but a religious author, arguing that only religion rather than science could bring meaning to humanity. While he still served as a foil to Ellie, he also acted as her love interest, which is the most radical change to his character. (Ken der Heer does not appear in the film.) In order to make his character appear more like a proper love interest, Joss is much less of a slow, soft-spoken philosopher but a louder, more direct religious man. The most glaring omissions of characters are the four other scientists who are charged to join Ellie in the Machine. In the film, there is only room for one person, but the novel's machine asks for five. Each of the four characters bring a new dimension to the experience, and allows Sagan to explore the questions extraterrestrial life would pose through the lenses of different cultures. In order to save time and money, the movie cut out all the characters, leaving Ellie to go alone through space. This change takes out a good chunk of the depth of the novel and removes the message of internationalization prevalent in Sagan's book. Speaking of that loss, the film couldn't help but drop one of the most important subplots in the novel, due to the end of the Cold War. The book, published in the mid eighties, suggested that in order to record the entire Message it was necessary for America to work with other countries, including the Soviet Union. This prompted the two countries to reconcile their conflicts. Many times in the novel it was suggested that slowly all the nations of the world were uniting thanks to the sudden discovery of another civilization. The film touches a small bit on that subject, but without the additional scientists traveling with Ellie or the United Nations summit discussing the possibilities and dangers of the Machine, much of the international aspect is lost. Despite these changes, the film remains reasonably faithful to the novel. The movie doesn't shy away from the religious and philosophical aspects, easily the most important part of the plot. Ellie and Palmer Joss appear as perfect theological opposites, and still manage to get along well enough. It implies a reconciliation of science and religion as two different ways of searching for the truth. The questions Sagan asks of the universe and beyond are posed in the film, and as in the novel, it's up to us to find the answers. Here are some reviews of the movie. http://www.coseti.org/klaescnt.htm gives an incredible amount of information about the movie while reviewing it. There is a detailed section about the science in the film. http://www.cnn.com/SHOWBIZ/9707/16/review.contact/index.html is a strongly negative review. But the reviewer apparently also hated Forrest Gump. Take that as you will. http://www.suite101.com/article.cfm/sf_and_society/44473 is a far more positive review than any of the others. It's the only one that doesn't criticize Palmer Joss's character.